Toyohara Chikanobu (1838 - 1912) Guard Ladies of the Chiyoda Palace, 1892. Oban triptych. Click here for a second detailed enlargement. One of Chikanobu’s best triptychs, this great piece of design comes from a series of triptychs titled Chiyoda no O-oku. 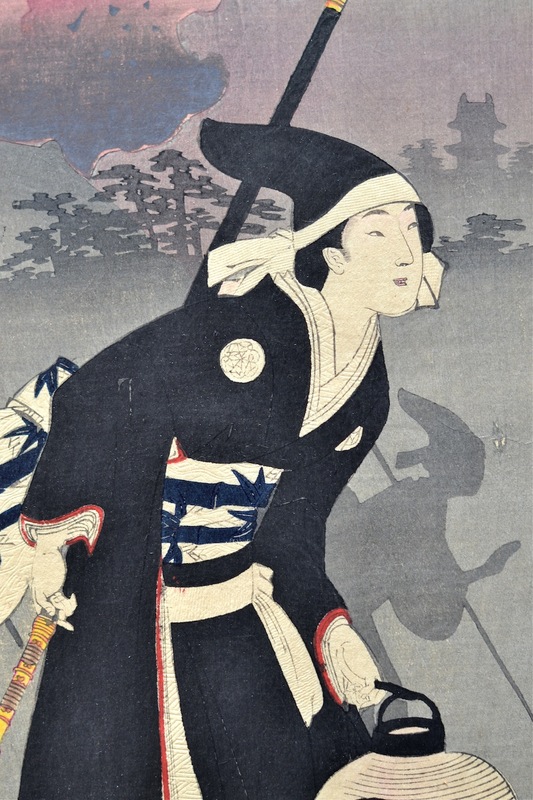 The series covers annual events participated in by the women of the Edo Castle at Chiyoda in Tokyo, (“Inner Palace of the Edo Castle”). The prints depict special seasonal occasions such as the celebration of the birthday of the historical Buddha and cherry blossom viewing, as well as more regular activities like poetry contests and flower arranging. The most dynamic scene of the series, titled Otachinoki or The Retreat, depicts women guarding the retreat from the palace during a fire. In Meiji 30 (1897). The six women in the foreground are guards, uniformly dressed in thick black robes and protective headgear. They are responsible for protecting the palace residents whenever there is a fire or other disturbance. 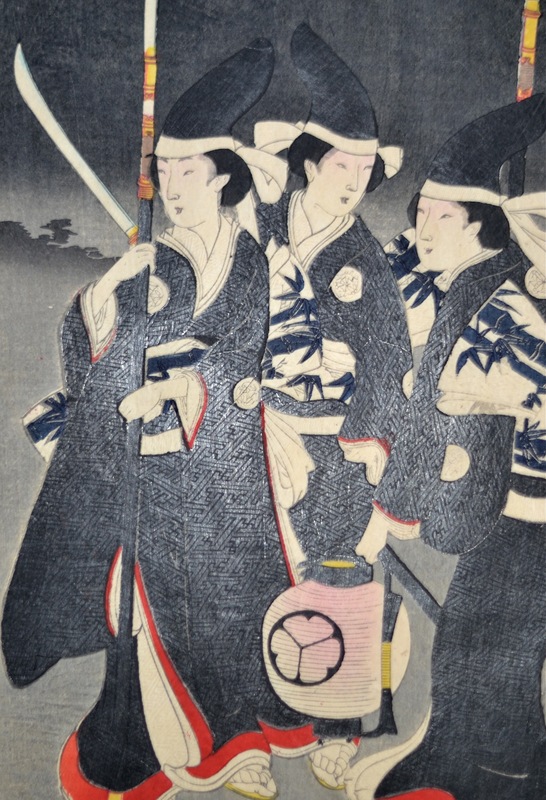 Several carry halberds (naginata); behind them in silhouette are similarly garbed shadowy figures and palace buildings set against burning embers blown from the Edo Castle walls. Within the hierarchy of the palace ranks, certain people were assigned heavy labour duties, such as carrying palanquins and fighting fires, and such women were often recruited from farming or merchant families. The elite guards of the Inner Palace would have come from samurai backgrounds. This is a terrific piece, showing women in nineteenth century Japan (again) doing masculine work. The print shimmers with glossy, blackened, shomenzuri (burnished) patterns on the women’s robes, which are also embossed at the collar. The drifting shades of bokashi evoking the night time scene and the blowing smoke from the fire is particularly striking. First edition of a notable print, and the best in this famous series. Very fine impression colour and fine condition. Three sheets, unattached and unbacked. Published by Akiyama Buemon (Kokkeido).